"I love the view fm the hotel"
Have a question for Muong Thanh Phuong Dong Hotel? 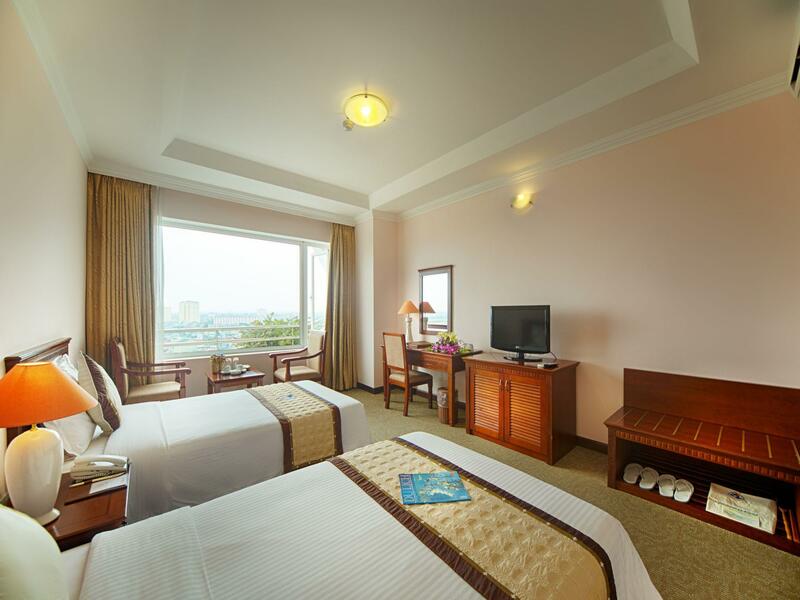 Designed for both business and leisure travel, Muong Thanh Phuong Dong Hotel is ideally situated in Vinh; one of the city's most popular locales. Only 0 km from the city center, the hotel's strategic location ensures that guests can quickly and easily reach many local points of interest. For those of you who want to venture out, Central Park are just some of the attractions available to visitors. 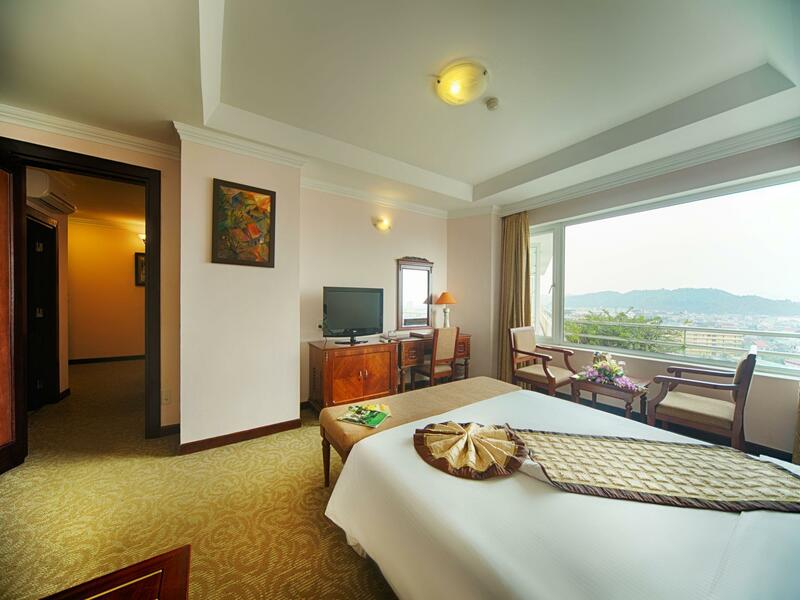 Offering hotel guests superior services and a broad range of amenities, Muong Thanh Phuong Dong Hotel is committed to ensuring that your stay is as comfortable as possible. Top features of the hotel include 24-hour room service, free Wi-Fi in all rooms, 24-hour front desk, Wi-Fi in public areas, valet parking. Experience high quality room facilities during your stay here. Some rooms include television LCD/plasma screen, mirror, towels, closet, internet access – wireless, provided to help guests recharge after a long day. The hotel offers many unique recreational opportunities such as hot tub, fitness center, sauna, outdoor pool, massage. 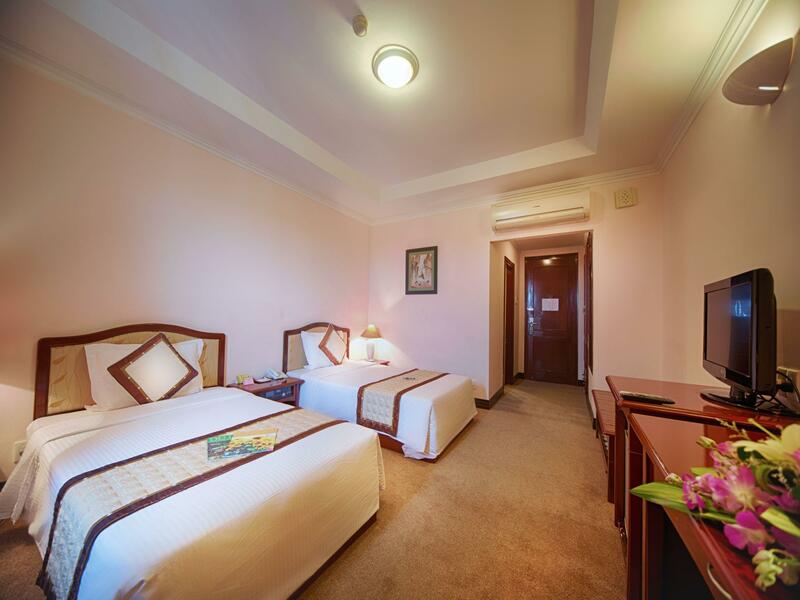 Muong Thanh Phuong Dong Hotel is a smart choice for travelers to Vinh, offering a relaxed and hassle-free stay every time. I had a chance to use the pool this stay. Excellent! Hotel is good but little old. The carpet isn't clean with smell of smoking. Bathroom need to renew. 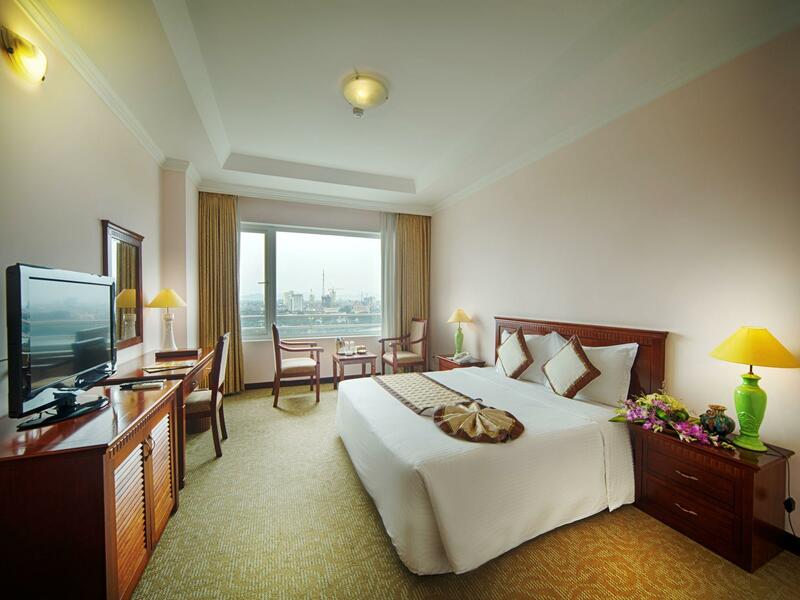 However it's best place for 1 night on the from Hanoi to the south or for business. Near by hotel, it's very easy to find delicious foods. Stayed 1 night only as traveling with families. Staff is good. Room is large but worn out. Breakfast with traditional food is superb. 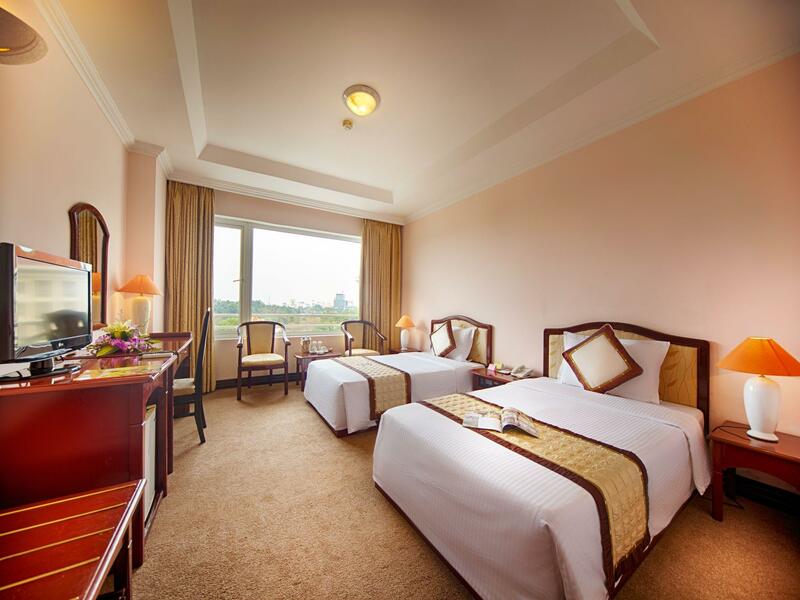 Convenient for those who want to rest 1 night before heading to Hanoi by car. We stayed 1 night only in late February en-route to Hanoi from Ho Chi Minh City. It is right in the middle of the City so it is convenient for any vehicle traveling north-south of Vietnam. The price is reasonable. The traditional food is great. The room is spacious but much worn out. I would recommend the hotel to invest on an upgrade. In room WiFi is good enough. The bathroom is a bit dirty as compared to my previous visits. However, the service and staff attitude has been much improved compared to last year's performance. I guess it is a plus for the hotel. However, except being a place to rest over night, there's nothing much to say about this hotel. The entry foyer is impressive but the rooms are a bit of a let down. They feel like motel rooms from the 80's. The breakfast is huge and could cater for hundreds even though I am sure no more than a handful of rooms were in use while we were there. The front desk staff are snooty - have lived in Vietnam for a year and never come across this kind of attitude before. The whole experience at this hotel was a little strange, but it is probably difficult to find better in Vinh. we staied only for one night, and did not see to much because ouer train started early in the morning. the hotel was nice and comfortable. for a superior room very good. we dicided to stay here only for one night because in vinh is not too much to see. not good for this hotels bussiness. Cledan, good serice and food. 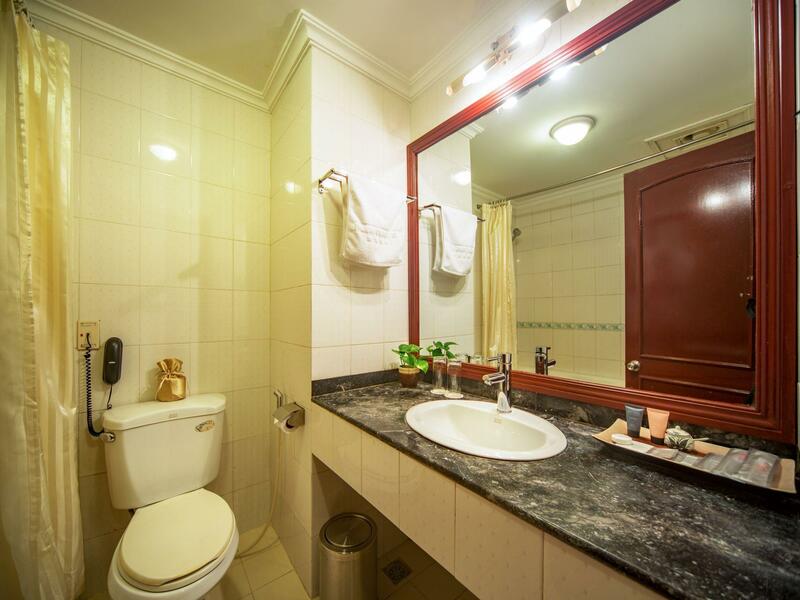 Close to Ho Chi Min sqaure and quick access into Vihn City Centre and airport. staff were very friendly to my children. babysiting service made my baby son very comfortable and he was happy to be with them. large rooms, very comfortable beds. pool was clean and cool. service in the rooms, restaraunt, lobby and reception were first class.staff were keen to be of assistance. fantastic restaraunt right next door that was a sensational eating experience for all of us, and so cheap. we will be staying at the phung dong next time we are in vihn city. We often spend weekends in Vinh city, and our hotel of choice is the Phuong Dong. I love the friendly staff, the rooms are very clean and comfortable, the price is right, and it feels like a second home to my 5 year old son and I. I personally think its the best hotel in the area, and I love the Beef pho for breakfast, it is really tasty. i have stayed couple of times earlier at this hotel and find that the quality is consistent. it's a clean hotel with good location and good service. rooms are well priced and spacious. breakfast in mostly local with little international variety. but manageable. The exterior look outdated. The room is fine but there not things much to praise. Breakfast not bad but you can get much nicer meal outside the hotel at great price. The service is not very welcoming non-business guest. I won't stay here next time. This hotel supposed to be one of the best hotel of the city but its condition is turning bad at first glance with shabby state outdoor. The room was fine but we can get a similar room at much cheaper price else where. The service here is very disappointing. We have already book the hotel for 2 night. After the 1st night, we decided to leave the hotel and the reception ask us to pay for an extra day since they though that we only paid for 1 night. This confusion is very annoying and make my mother upset. have stayed at this hotel 4 times now in the last year, and i really like it there. the friendly staff and the affection they show to my son, always makes our stay special. everything is always competently performed and nothing is too much trouble. i would always book here when in vinh city. we stayed at sengtawan riverside hotel for many days, it was very relaxing and comfortable for our family. one of the downsides of the hotel is it's location. it is very far away from the main center of the nightlife for food and markets, it is a long walk to get to where you need to go. on the other hand. if you want to stay somewhere with a nice view and great service with limited noise, it is a great place! large rooms, good restaurant, pool, personalised customer service!!! This is our second stay at the Phuong Dong Hotel, the last visit was 8 months ago. The staff remembered us from our lastg and gave us the same great treatment as before. The room we stayed in had great view of central highway though the town, we had a large sized room, with all the necessary amenities. The restaurant adjacent to the hotel, is excellent, breakfast buffet has a good selection of items, but don't wait till the last minute as you will miss out. Hotel remains clean and had excellent Christmas decorations and atmosphere for this festive time of year,great addition for the children. I like this hotel, I am sure its the best hotel in town, and if not, the staff make it the best one in town. They speak great English which is such an added bonus considering most other people in this general area, do not have the language skills of people in big cities like Hanoi and HCMC. and the bellboys and staff make sure your taxi driver knows where you want them to go and translate for you happily. The staff did not explain clearly to me, first they said children more than 7 years old have to pay for the breakfast. Then when we checked out, the receptionist insisted thatI have to pay, I have explained that the previous receptionist told me so but she seemed do not care and she did not even reply, we paid but we were not happy with the response. The breakfast was really bad, the food was not enough. The room was not clean so I had few pumps after sleeping for a night. The bed was old and I have back pain after sleeping. The price was quite expensive compared to the service provided.